Today’s Pakistan Super League (PSL) match was an important one was tournament is now advancing towards the next, knockout stages. So interest of people is increasing. This notion was evident at official video stream of PSL at youtube which is setup by PCB (Pakistan Cricket Board). At this stream previously on peak moments at most few thousands over 20 thousand were seen online. However, today over whooping 53000 plus people were seen online simultaneously. This number equals to a very big capacity cricket houseful with the crowd watching the match. Plus, this is just one stream there were many other online streams available online, as well as on youtube itself. Plus the stream we are talking here is only accessible from within Pakistan. This point is although the first season of Pakistan’s own cricket league is being played outside to Pakistan due to security reasons, it is no doubt getting too much popularity inside and outside Pakistan. These numbers are however expected to grow by many folds as we get near the end of tournament. 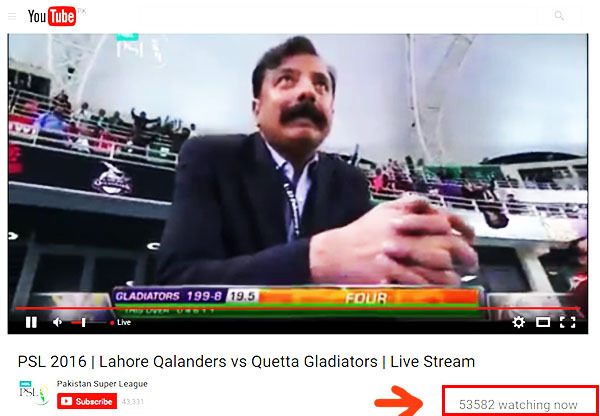 Than we expect to see several hundreds of thousands people online at same time watching PSL using official Video stream of tournament at Youtube. Its worth mentioning, that Youtube was blocked in the country from last 3 years. Its just recently opened in the country after Google have setup the local domain of video sharing site for Pakistanis and enabled the government to request blocking of any objectionable content in the country. And here it is, serving its purpose here in Pakistan too.